We provide a total solution for the the product manufacturing from the R&D stage to the manufacturing start-up. The best performance camera for preventing of molesting and for monitoring system for "safety and security" in train cars. More than 9,800 units have already been installed and active as surveillance cameras in over 2,900 train cars in China subway since the 2008 Beijing Olympics and Shanghai World Expo. It is installed in the JR express train as well. This can fit in a narrow space. No stress by the appearance of camera. The camera can fit into a space of 47mm high over the ceiling and only φ2cm lens is exposed. This does not impair the aesthetic appearance. All directions become in the shooting range. No blind spot. This can reduce the number of cameras to use as well as the installation cost and the labor for monitoring. Possible to output the analog image signal (NTSC or PAL) at the same time of outputting M-JPEG image. 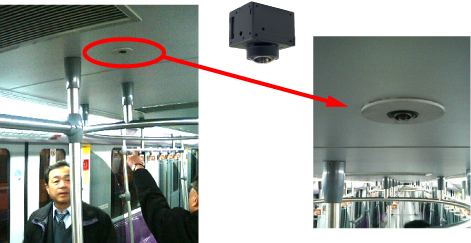 At the Shanghai Subway, our surveillance cameras have been effective due to arrest of abusers in the vehicle. In another form, images from our cameras were also introduced on the Internet. CFCT-360F itself does not have the network feature. HOwever, please ask us about an optional possibility. Copyright OPT Corporation. All rights reserved.